Check out a heartwarming tale of how orchids, despite their fragile reputation, have come back to life in New Orleans after Katrina. Thanks to volunteer Richard Bergeron and a gang of dedicated orchid maniacs, the orchid collection has been reborn, growing from a bare handful to a thriving conservatory exhibit of more than 100 specimens – with hundreds more awaiting their moment in the spotlight. Their mission is to display the plants in a way that mimics their natural environment. No more tables stacked with blooming orchids in clay pots. According to local press, the Rain Forest exhibit features ‘Vanda orchids suspended from tree limbs, their bare roots cascading down as they would from the tree tops in their native environments. 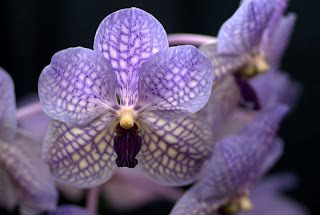 Phalaenopsis grow from the sides of fig branches, extending out horizontally because they grow that way in nature in order to avoid having water collect in their crowns’. Meanwhile, smaller terrestrial orchids cling closer to the ground, shaded by leaves, while a vanilla orchid wraps itself around the trunk of a tree. Astonishingly, they now have more than four times the number of orchids than they did before Hurricane Katrina struck.